Kwok Ka-ming won the individual bun tower race this year. Local children atop poles join the bun festival parade on May 21. Offerings on the waterfront appease the dead on the last day of the festival. Cheung Chau's two bakeries sell special steamed buns stamped with the character "peace". Much of culture is about making stuff up for fun. In this, Cheung Chau excels, as it creates buns, tower runs, legends and rituals to match. Doug Meigs reports. The god of the ghosts, mountain and earth kept watch over the festivities, as a hundred thousand revelers sated themselves on steamed buns. For three days this month the sleepy island of Cheung Chau was transformed into a hub of vitality, engulfed in bun-mania. Candice Cheung, 20, had always wanted to visit the festival but had been daunted by the interminable queues at the ferries, and the swirling crowds on the island. This year, determined to take part in the festival, she queued up at 10:30 am, Friday, waiting for the ferry that would take her from Central, hours before the procession on the last day of the festival. Cheung Chau's population of 50,000 nearly doubled on the final day, with etween 40,000 and 50,000 visitors swarming through the island's winding streets. The final three festival days require villagers to eat a vegetarian diet, so McDonald's features a special menu with veggie burgers during those days. Police partitioned brick streets and alleys. Spectators packed tightly together as parade participants assembled. A cacophony of drums and horns heralded the procession. Dragon dancers, musicians, volunteers and locals (some pushing baby strollers) and tiny costumed children waved to the crowds from atop poles, as the procession made its way. Temple deities from all eight of Cheung Chau's temples joined the final day's procession, carried in covered sedan chairs before returning to a makeshift bamboo altar beside Pak Tai Temple. 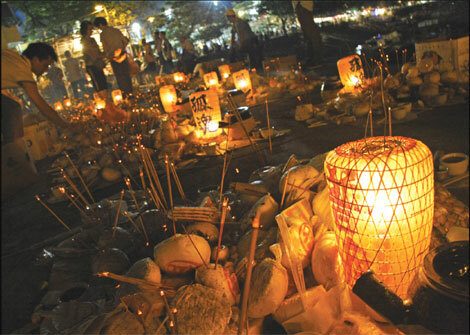 The festival combines superstition with tourism and commerce. During the parade, dragon dancers subtly reinforced this correlation, bowing to a temple beneath an enormous Coca-Cola advertisement. Other festival commercialism appears even more obvious. "We invite all the gods to participate in the event, then they go back to their temples on Saturday," said Patrick Cho, 58, a resident of the island and an employee of the Islands District Council. After the parade, volunteers dismantled a number of mini-bun towers. Strings of buns unraveled and tumbled onto the floor of a community building. Volunteers cut and bagged the buns for local donors. "The most important part of the festival is its message, 'peace,'" said Kwok Tai-hang, a policeman on Hong Kong Island who commutes from his home in Cheung Chau every working day. Certainly "peace" is much in evidence, as the Chinese character for peace is stamped on every one of the multitude of steamed buns at the festival. Cheung Chau's Hong Lan Bakery and Kwok Bum Bakery prepared buns imprinted with the same character until midnight on Friday. The two local bakeries also sell them year-round. Cheung Chau buns have special medicinal power, said Katie Leung, a 19-year-old resident. "We might think it's funny, but the older residents believe this very deeply," she said. "They don't eat the fresh buns, only the ones that have hung on the towers. If they don't have a disease or an illness, then they hang the buns outside their door." Days before the festival, she noticed moldy buns still hanging outside a neighbor's home. Now that the festival is complete, she expects to see fresh buns hanging around town. 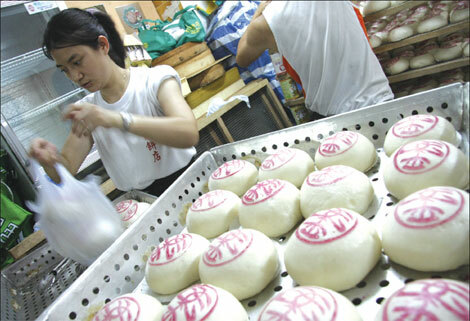 Ng Wing-fan, an employee of Hong Lan Bakery insisted that fresh buns offer the same benefit, as long as they bear the character "peace". "One bun is enough for me," said 64-year-old local Wu Pak-shum. During the weeks preceding the festival, an elderly "bun master" and his son built three traditional bun towers beside Pak Tai Temple, while a construction crew erected a metal bun-racing tower in a nearby soccer field. The bun festival dates back about 200 years, said 58-year-old local resident Patrick Cho, an employee of the Islands District Council. Plague and pirates once ravaged the island. Villagers despaired until local fishermen discovered an effigy of Pak Tai, the Taoist god of the north. Villagers paraded the deity around the island. Evil spirits fled. The tradition has continued through the modern age. Cho learned the legend as a child. He has since researched the festival history for his government job. Festival highlights include over-indulgence of steamed buns, a parade and bun-tower racing. Festival customs have changed over time, he said. An earlier tradition change came before Cho or Wong's birth: the hoisting of children on poles. Cho said some local villagers learned the custom from a festival on the mainland 80-90 years ago. Offerings along the waterfront, lanterns and buns stuck with incense sticks, appeased wayward spirits from a long-ago plague. Festival staff moved the god of ghosts beside a bonfire ushering the spirits home. Then at midnight came the highlight, the bun race. Bun racing was discontinued for many years after a 1978 bamboo tower collapse injured more than 100 people. The race used to be open for anyone to climb. Local resident Wilson Wong said he doesn't miss the old style of bun racing. "It was too dangerous, it's safer now," he said. Wong was 24 years old when the tower collapsed. He remembers the pandemonium well. He was trapped inside the bamboo structure and injured his hands. Cho said bun racing was always a major point of interest, but the festival remained popular without the custom. In the years leading up to 2005, he said the festival attracted about 20,000 visitors. That figure doubled when bun-racing returned. Hong Kong's Leisure and Culture Services Department revived bun racing five years ago with an iron tower, proper climbing harnesses and a limit of 12 racers. 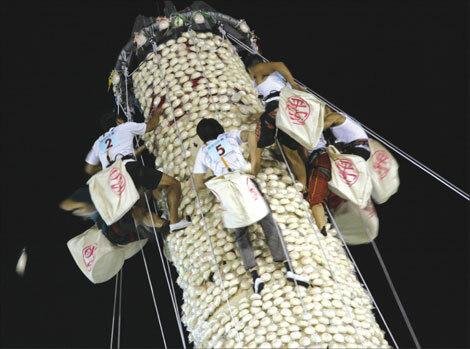 In 2007, plastic buns replaced steamed buns on the competition tower. This year's finalists emerged from 83 competitors at time trials on May 15. 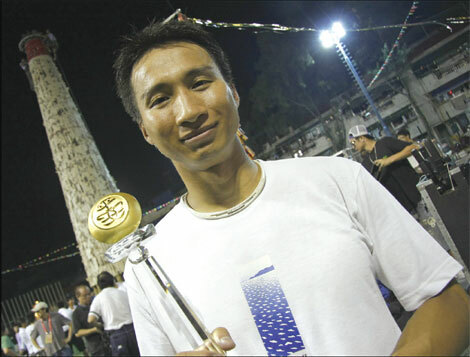 Three-time winner Kwok Ka-ming, a Cheung Chau local, returned the championship trophy to the island after a Hong Kong racer won last year. Kwok returned to his regular life this week. The physical trainer for Shatin firefighters said he plans to race again at next year's festival. "This is something all Cheung Chau people should do, and I'll continue until I'm unable," Kwok said. 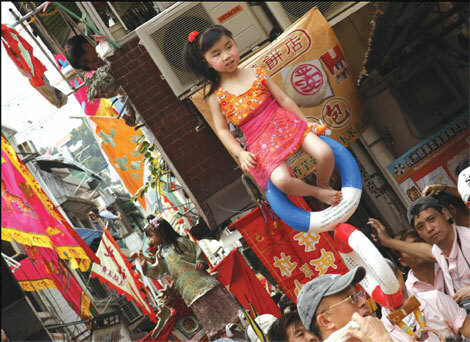 The 2010 Cheung Chau Bun Festival lasted officially from May 19 to 21. That was the event witnessed by visitors. People who live on the island spent months before that, in preparation. Now that the festival is complete, souvenir stalls continue selling overstock bun merchandise year-round. Life on Cheung Chau is returning to normal now, back to the laidback routines that characterize life there during the rest of the year.